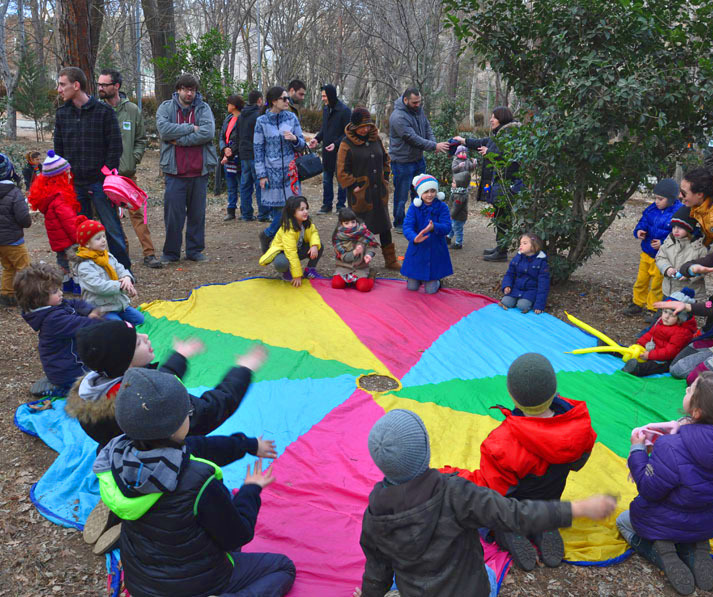 TBILISI, DFWatch–Around a thousand people showed up in Vake Park in Tbilisi Sunday to protest against the construction of a new hotel. The event, which was planned on Facebook, brought together people, families, some with dogs or carrying balloons, enjoying snacks and games for children. The rally, which lasted about four hours, was held in front of the fenced-off area where the new hotel is planned. Music was playing with Georgian DJs and performers. The whole day, children and teenagers were playing Frisbee, making soap balloons, making drawings in support of Vake Park, crafting different things like a bird’s nest in the shape of a hotel. 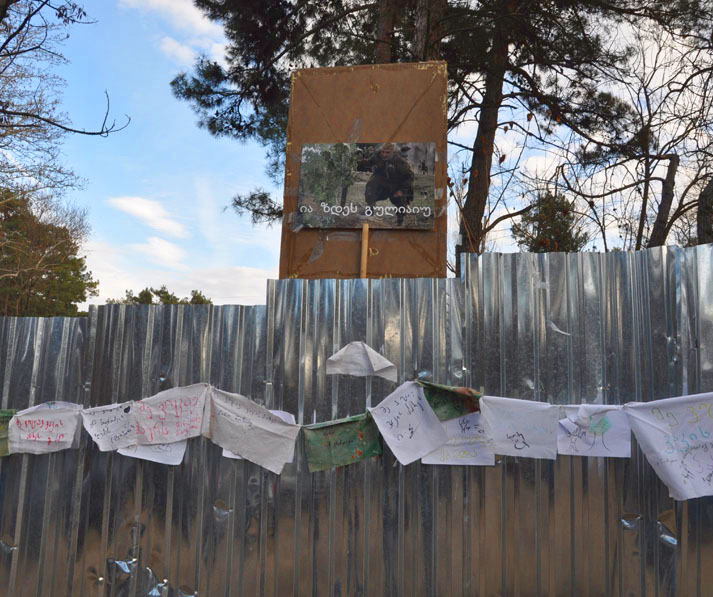 The fence-off area where the hotel will be built is now full of children’s drawings and posters, which read ‘O2VS$’, ‘I love Vake Park’, ‘I like green’, ‘I love nature’, etc. Temuri, who came to the park with his wife and three-year old son, tells us that he spent his childhood in this park and wants his child to also have a place to play and breathe normally. “I’m not sure about the legislative details, but I know this is a recreational zone and a hotel cannot be built here, so we came to protest,” he said. Nata Peradze, one of the organizers of the rally and member of the group Guerrilla Gardening Tbilisi, said during the rally that the protest will continue. She says people don’t want to fight, but need peace and need a park with pleasant activities; a park which should be part of everyday life, not private property. Aleko Elisashvili from the organization Tiflis Hamkari says he wants to live in a city where trees are not cut down in order to build hotels. “Only one park is left in Tbilisi, in fact, and they are destroying it,” he added. “The planned construction will have devastating environmental impact on the life of the city and its citizens,” says an online petition to save Vake Park. The petition currently has about 6500 signatures. A few days ago, Tbilisi City Hall decided not to withdraw the building permission for Tiflis Development to construct Hotel Budapest after campaigners lodged a civic appeal. Activisits plan to continue their fight through court. Irakli Abesadze, Deputy Mayor of Tbilisi, explained that the now closed restaurant Budapest and the car road leading to it, both dating back to 1958, were never part of Vake Park. He said it has been private property since 1998, and in September 2013, permission was given to construct a hotel on the location of the old restaurant. Abesadze continued saying that Tiflis Development is investing USD 22 million on building the hotel and are willing to employ 1200 people. A few days ago it finally became clear that the new hotel Budapest is going to have seven floors, despite claims from City Hall and the investor that it would have only five floors. Tiflis Development purchased the old restaurant Budapest for 2.7 million lari (USD 1.5 million) and will construct a hotel with the same name. Last week, the company’s director Giorgi Zakaidze said that they own 2900 square meters, but hotel will take up only 1300 square meters. December 26, Tbilisi City Hall gave the company permission to cut down nine trees in Vake Park. Tiflis Development is a company owned by Georgian-Kazakh Investment Group, which was established in May 2007 and mainly implements projects in Tbilisi.